HA Volume is a recreation of VSX Volume for use with any ‘media_player‘ on Home Assistant instead of just Pioneer AVR’s via the telnet protocol. 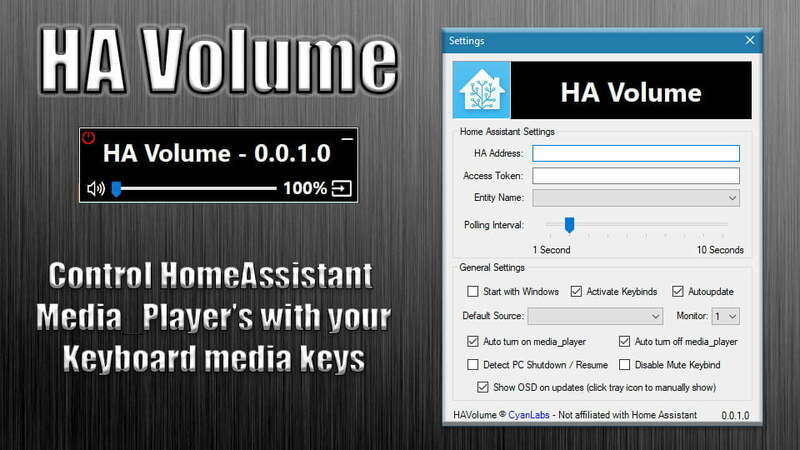 Just like VSX Volume, HA Volume hijacks the volume control keys (Vol Up, Vol Down, Mute) to control your Home Assistant media_player entity via the HA RESTful API instead of the computer volume. It also has a built in source selector, auto turn on/off of media_player when application is started and even when the computer is suspended or resumed. Unlike with VSX Volume, HA Volume has a settings form to allow for easier changing of settings. You will need to have a Home Assistant instance that has the media_player you want to control and you will need to generate a “bearer token” also known as a “long lived access token”. Once you’re logged in to your Home Assistant instance, you can see the details of your account at the Profile page by clicking on the circular badge next to the Home Assistant title in the sidebar. Scroll to the bottom to find Long-Lived Access Tokens, click Create Token, enter a name, and be sure to save the token generated because you won’t be able to get it again. Once you have the token you can enter it in HA Volume. A full description of each configuration option is below. Any entity in Home Assistant which is detected as a “media_player” such as chromecasts, onkyo, spotify etc. Access Token: Long Lived Access Token from HA, how to generate one is mentioned in the Getting Started section. Entity Name: This list is automatically generated from your HA instance, it will list all media_player entities but they may not all work. Polling Interval: Change how often HA Volume will refresh data from HA. Start with Windows: Automatically launch HA Volume when windows starts. Activate Keybinds: This is checked by default but you can disable this to prevent the keyboard media keys hijack. Autoupdate: This is checked by default but you can disable it to prevent the application from communicating with our server to check for updates. Default Source: This is the source that will be set when you right click the source button. it will also be the source that is automatically set when the program is launched. Monitor: This will let you set which monitor you want HA Volume to show on, the settings window will change to the one selected to give you a preview of sorts. Automatically turn on media_player: This will turn on the media_player when HA Volume is launched. Automatically turn off media_player: This will turn off the media_player when HA Volume is closed. Detect PC Shutdown / Resume: This will turn on/off the media_player when shutdown and resume are detected. Disable Mute Keybind: This will disable just the mute keybind. Show OSD on updates: By default the OSD will pop up when updates are detected such as volume changes and source changes, this can be set to only show when the tray icon is clicked by un-checking this. The application contains a built in updater which can be disabled. It gives you the option to download the update now, later or skip the version completely, you can also right click the notification tray icon to check manually.